Hi there, I am half way through building a rotary axis for my cnc router, I am using uc100 and I have a 4 axis break out board, I need to know how to set the axis up in uccnc, are there any plug ins or wizards available in uccnc? UCCNC does not have a rotary axis function, all axis wthin uccnc are treated as linear axis. That being said, some people tend to use the 4th axis as an indexing axis and then its contol becomes a little simpler to consider with regards to operation, or as a spindle in the case of a lathe, then the incremental motion tends to be less of a concern. No, there are no plugins / wizards within uccnc for 4th axis motion. The 4th axis is normally the "A" axis, or "B" or "C" depending upon the orientation to the other axis. I've also heard of the slaved axis being called UVW.... but I don't think this is quite right as they are "normally" secondary axis additional to the primary XYZ axis such as the image below. What is it you "really" want to do (what sort of motion)? I have a 4th axis on my plasma, it's treated as a linear axis with sheetcam so uccnc not having a rotary axis option makes no difference to me. Hoever, it uses a 200 step/ revolution stepper, which operates on 10 micro steps and have a 6:1 gear reduction drive. You could also set it up in radians or any other unit that takes your fancy and serves your purpose. You also need to consider that the object you are machining will have an outer diameter which in turn provides a circumference which translates to a "linear" distance relative to the diameter of the 4th axis. 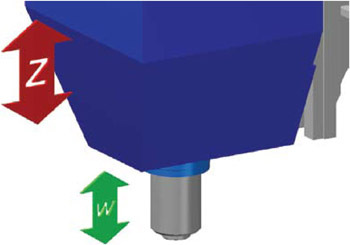 Machining a 100mm (4") object at 200mm/min will give a totally different 4th axis rotational speed than a 50mm (2") object. It is possible to correct for this but not via changing the step on the fly..... you have to change the feedrate..... and also consider that a 100mm metal bar spinning at 4000rpm could become quite a projectile if it came loose..... but you probably won't be getting that out of your 4th axis with a stepper motor though. I had a go at creating a constant surface speed macro a while ago. Have a read of this post, you'll need to modify the macroloop as per the suggestions in the post. have Mach 3, may have to go back to it just to operate the rotary, or I may just stop building it and wait for uccnc to add rotary axis to their soft ware ( If ... and When ?). For all 3 axis work I use UCCNC but for rotary axis work I revert to Mach3. If UCCNC interpreted G93 (Inverse time mode) then it would be a big step forward IMO. way I would greatly appreciate it. Just set it up as the A or B axis, and set the steps/unit to be steps/degree of rotation. You'll likely have issues with the feedrate, though, without G93 or some other method of properly controlling the feedrate at different depths of cut.